There's something slithering in the grass, but do not fear! It is only the friendliest mahjong solitaire snake in town! This quick and fun mahjong solitaire game will leave you salivating for more mahjong solitaire- fortunately, 247 Mahjong Solitaire has it! Just look below the game! 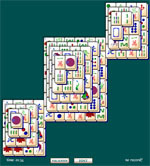 Mahjong Solitaire is played by matching identical tiles (in most cases) to get rid of them from the snake mahjong solitaire tile game. If you're wondering about the other cases, they're easy and helpful. 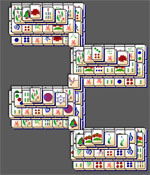 Mahjong solitaire has seasonal mahjong tiles and flower mahjong tiles. 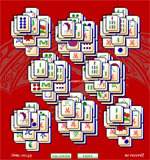 These mahjong solitaire tiles can be matched exclusively to any other mahjong solitaire in their set. 247 Mahjong Solitaire has helped you recognize these by putting number in the corner of the mahjong solitaire tiles this rule applies to. Help 247 Mahjong Solitaire by sharing us on Facebook for all your friend to enjoy. 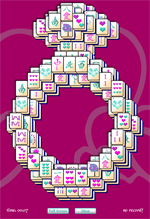 As a gift to you, we offer unlimited mahjong solitaire snake hints!